Magical Villa in 5 acre walled garden with tennis court and overflow pool. 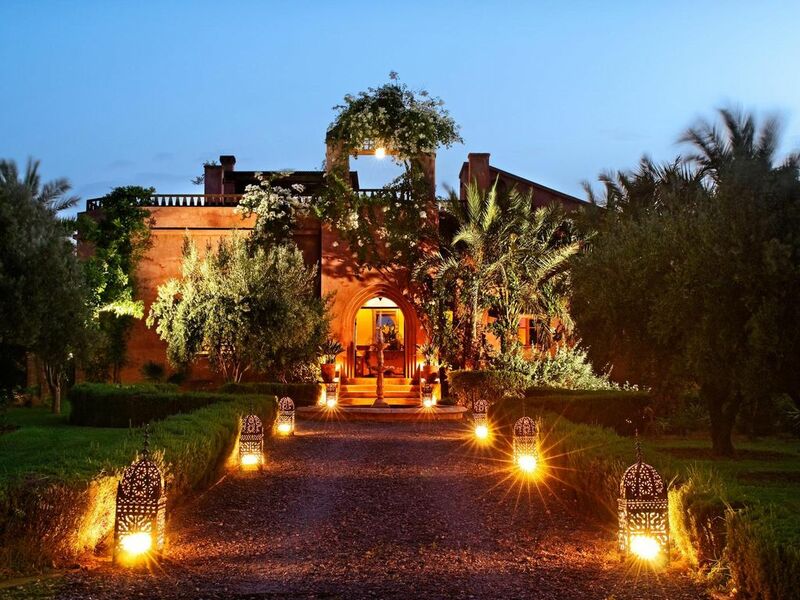 Villa Alexandra is one of Marrakesh's most tranquil and stylish country houses - cool classic architecture and beautiful interiors - set in a secluded five acre walled garden full of palm, olive, citrus fruit trees and roses. It was built in the 1920's by a Frenchman and the Mediterranean/Moroccan architecture works very well together. This serene location and the cool pure air from the mountains mixed with the scent of the orange trees make it a wonderful place to relax. Contrary to popular belief, the temperature outside Marrakech is wonderful during Juy and August, as long as you are surrounded by a lush and tropical garden. There is no humidity, so what can be high temperatures (33-38 degrees )in those months, are very bearable. Completely private, the villa includes a 20 metre swimming pool with shady pergola and bar for lunch, clay tennis court and spacious terraces throughout. The villa has 6 permanent staff and they are included in the cost of your stay as are all meals. They have been with us for nearly 16 years and are very discreet but super efficient and they all speak English. Latif, our house manager is a font of information, so if you have never visited Marrakech before, he will be able to tell you where to go, what to see and where to shop! Our Moroccan cook is superb at traditional and European food and many of her ingredients come from the garden, she also makes the best home made ravioil in town! She can cater for most dietary requirements, you only have to ask. The house is 13km south of Marrakech on the road to Ourika and 20mns from the airport. There is now a large choice in excellent golf courses and the newest, and one of the best to play, is 10 minutes down the road. (Les Jardins des Atlas). In addition to Golf, the complex has a waterskiing complex which is suitable for all ages. We also have an excellent tennis coach who can visit the villa to either make up a four or teach adults and children. My father spent 10 years living full time at Villa Alexandra and we still have the same wonderful staff that he trained and that looked after him so well. Most of them speak English and their attention to detail and pride in their jobs is what makes Villa Alexandra such a special place to stay. The garden is an oasis of palms, olives (our own olive oil) and of course all our own oranges and lemons. We have now found a excellent tennis pro to teach or play on the newly re-surfaced clay court and our pool being 22metres long is very special. Its such a wonderful contrast - the serenity and birdsong of the 5 acre gardens and then the wild, heady atmosphere of downtown Marrakech! Everyone says it is magical and as most of our guests come back 4 or 5 times, it must be true! Villa Alexandra was built in 1930 by a French Colonel as his country residence, I think that's probably why it has a more Mediterranean feel to it, far lighter than a traditional Moroccan house. When we first walked through the gates into the magical garden, we knew it was the house for us even though it had been uninhabited for many years - the kitchen was in the Pool House where about 8 tagine ovens had apparently catered for up to 50 guests at a time! We virtually rebuilt it, putting in all modern necessities but retaining the original internal and external structure. And of course the Ping Pong table! There is always a gentle breeze from the mountains, very little humidity and our wonderfully lush garden provides a haven for all species of birds. Its hard to believe we are only 15mns from Marrakech! Villa Alexandra is positioned on the south side of Marrakech, on the road to the Ourika Valley and Atlas Mountains, so if we are going on a trip to the valleys, mountains or desert, we don't have to drive through town which is a huge bonus! The same applies to getting to the airport, the souks and Gueliz (the main shopping and restaurant area). Having 6 discreet permanent staff means that you can completely relax, never have to worry about food shopping or cooking (unless you want to!) and just know that they have your comfort and enjoyment as a top priority. The clay tennis court plays extremely well and our extra long swimming pool (20metres) has also got a deep end so even in the hottest of summers, it stays refreshingly cool. It really does feel like your own private hotel! Very few private villas have their own tennis courts but we are keen players and Hamid keeps our newly re-surfaced clay court in top condition year round. Bedroom 1: en-suite shower, separate WC; Bedroom 2: en-suite bath/shower over, separate WC; Bedroom 3: en-suite bath/shower over, bidet, WC; Bedroom 4: en-suite shower, WC; Bedrooms 5 and 6: bath/shower over, separate WC; Bedroom 7: shower, separate WC. In main sitting room and the blue and yellow bedrooms. There is a huge amount of discreet car parking available. Elegant, light and spacious L shaped drawing room with high ceilings and double doors leading onto covered terrace and gardens. Comfortable sofas and chairs and open fireplace for the colder months. A connecting dining room seats 12. Fouzia and Saida are in charge of the dishwasher. Large fully equipped kitchen with cooker, hob, microwave, fridge, freezer and separate walk in Cold Store. All meals are prepared by our excellent cook, both traditional and international cuisine. The villa is not let on a self-catering basis. 5 acres of walled and private gardens. Full of palms, grasses and citrus trees. 90 olives provide the olive oil for the house. And acres of lawn - very unusual for Marrakech! Lovely leafy veranda outside the sitting room where dinner is served. Fabulous roof terrace over looking the garden - white cushioned seating area where we have drinks in the evening. Ideal for parties of up to 50. The ski resort of Oukaimden in the Atlas Mountains is about an hours drive. All the necessary equipment can be hired including clothes! In March you can ski in the morning and sunbathe by the pool in the afternoon! Recently resurfaced clay tennis court which plays extremely well. Watered and rolled by Hamid our groundsman. Marrakech has several wonderful golf courses, some yet to be completed - we would recommend the following three which are situated within 25mins of the villa: The Royal Golf de Marrakech (18 hole - 6200m - par 72). La Semana, 18 holes and the Noria, 18 holes and closest to the Villa. All rooms are on the ground floor and can be accessed or adapted for wheelchair users. There is a wheelchair and walking frame available at the house if needed. Notes on accommodation: Our English speaking house manager will attend to your every need, from collecting you from the airport to recommending places to visit, booking restaurants, running the house and ensuring that all your requirements are met. His wife is an excellent cook, and will produce home made ravioli amongst other delicacies. The pool area and clay tennis court are maintained by our groundsman and 2 gardeners keep the roses, vegetable garden and lawns in pristine condition. The staff live in houses within the walls at a discreet distance from the house. Villa Alexandra is not let out on a self catering basis, it feels more like staying in your own private hotel. All meals , as well as afternoon tea, are included in our prices and special dietary requirements can be catered for. Outside: The mature 5 acre garden is enclosed by high walls and is abundant with palm trees, olive trees (we make our own olive oil), citrus and fruit trees. A thousand roses scent the air along with mimosa and jasmine and is a perfect haven for birds. The overflow swimming pool is 20m x 5m, with a 'beach' area, ideal for small children to paddle, and there are plenty of sunbeds and parasols. The Pool House has a drinks fridge, ping pong table, changing area, shower and wc. The clay tennis court is maintained to a high standard and there are racquets available (always best to bring a fresh tin of balls!). The pool can be heated on request, usually November - April (extra cost applies). There are various terraces around the property which are ideally situated for different times of the day. Utility Room: Washing machine and ironing board. Our housekeeper attends to all your laundry requirements. Cleaning / Towels / Linen / Maid service: The house is fully staffed and all linen, towels, dressing gowns are provided. Personal laundry can also be attended to. Other: Separate library with 42" TV, DVD, Sky, computer (adult use only). Large selection of books. The terrace outside the drawing room has a large table and seating for 12, the terrace by the pool is used at lunch and the roof terrace for pre-dinner drinks. One of the most comfortable and friendly places we have ever stayed. Its our 4th visit but it gets better and better, mostly because of its beauty and perfect situation but also because of the Management, Latif and his staff, who are all perfection. The food is always perfectly balanced and delicious. You really don't have to leave the place because of pool, track, tennis and table tennis but if you want to Latif is able to suggest ideas and arrange them and always "no problem"! Highly recommend its tranquility and serenity. 5 star deluxe but still home! This was our 4th stay and it only gets better! The Manager, Latif and the other staff are quite incredible. Nothing is too much trouble - whether it be trips to the Atlas, dinner out or just information about Morocco - everything is "no problem "! The accommodation is so beautiful and bedrooms are stunning. The grounds and gardens are lovely and its just such a bonus to be able to walk, play tennis, boules, table tennis and swim all within the perimeter. The food is also perfect! totally balanced and delicious. The fact that it is just 20 mins away from town and airport but a million miles from the noise is a huge bonus so all you hear is amazing birdsong! This was our 4th stay at Villa Alexandra and I cannot imagine not planning to return over and over again. Firstly, the villa is beautifully decorated with fascinating art and crafts from Morocco and India. The bedrooms are large, comfortable and very well maintained all with adjoining bathrooms that would put many 5 star European hotels to shame. The grounds are filled with olive and date trees and birdsong and thanks to the swimming pool, tennis court and pingpong leaving the property to sightsee is a wrench. An additional incentive to stay put are the delicious meals provided by Fouzia who patiently will explain how to make some of her specialities. The most compelling reason to stay at the Villa Alexandra, if one was needed, is the incomparable welcome and attention provided by Latif, the manager, and his team. No request is too small or too large and we always miss them for weeks once we leave. Whether for sightseeing and exploring or just staying put, a stay at Villa Alexandra is a truly spoiling experience. It cannot be recommended highly enough. An all-round five star holiday in every way! The house is extremely comfortable, the pool is amazing and the staff go all the way and beyond to make you feel completely at home and extremely relaxed. The food is really good and varied and always beautifully presented. We would not hesitate to recommend a visit to this villa! Autentisk villa i en meget smuk stor have med det mest fantastiske personale. We have two excellent tennis coaches who come from the club tennis club in Marrakech and can teach children and adults or just make up a game. They have been highly recommended by several of our guests. There are many excellent golf courses about 20mns away from the house. The green fees are very reasonable, the courses are in excellent condition and there are 3 sets of playable clubs available to borrow at the house. The famous fishing town of Essaouira is 2.5 hours drive and is certainly worth a day trip to visit the old Medina or an overnight stay. It is always very windy but is a charming white and blue town with horseshoe harbour where the fishing boats unload their varied catch direct to the waterside street cafes. Oualidia, a lagoon north of Saffi is the same distance but has a lovely beach - a must for an overnight stay to sample the crab claws and locally harvested oysters. The nearest airport is Marrakech Menara Airport - 20 mns by car - Self drive or chauffered car/minibus hire can be arranged for all other excursions and is recommended. Easyjet, Ryan Air, Thomson, British Airways, BMI and Royal Air Maroc all fly from various UK airports on a daily basis to Marrakech. Marrakech is 13km. We are 10kms from Ourika, the fertile and scenic valley where almost all the vegetables and fruit are produced for Marrakech and where there is a wonderful Berber market on Mondays. The High Atlas Mountains are just beyond, endless walking and riding possibilities. The 5 cascades of Setti Fatma are close by and provide a more challenging excursion. Morocco is a fascinating destination and Marrakech is positioned perfectly to enjoy the diverse landscapes and cultural activities. The desert, the mountains and the sea are all within hours, your stay will never be long enough to enjoy all that it has to offer. Marrakech is vibrant and full of the most wonderful restaurants and nightlife. The contrast between the more modern town and the souks of the old Medina are a source of fascination - the shopping is excellent in both! There are endless cash points but not all work all the time, the situation is similar with credit/debit cards - whoever you are, please take several as, for no reason at all, they can be rejected! Booking Notes: A deposit of 25% is required to secure your booking. Full payment is required 6 weeks prior to your rental commencing. We also require a deposit of £250 against damages/breakages payable with the balance and which is refundable at the end of your stay, less any reduction in the unlikely event of any damage having taken place. Changeover Day: Changeover day is flexible as are arrival and departure times and need to be discussed at the time of booking. Notes on prices: The prices quoted are based on 8 guests and this includes all your meals and soft drinks, as well as afternoon tea, homemade cakes/biscuits, and canapes before dinner. There is a discount for smaller parties. Additional guests are charged at £600 per person per week up to a maximum of 12 guests. Over the Christmas and Easter period the basic price for 8 guests is £8,500 pw with extra guests charged at £700 per person per week. Pool heating is excluded.